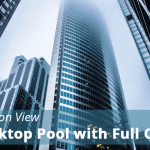 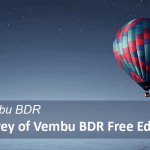 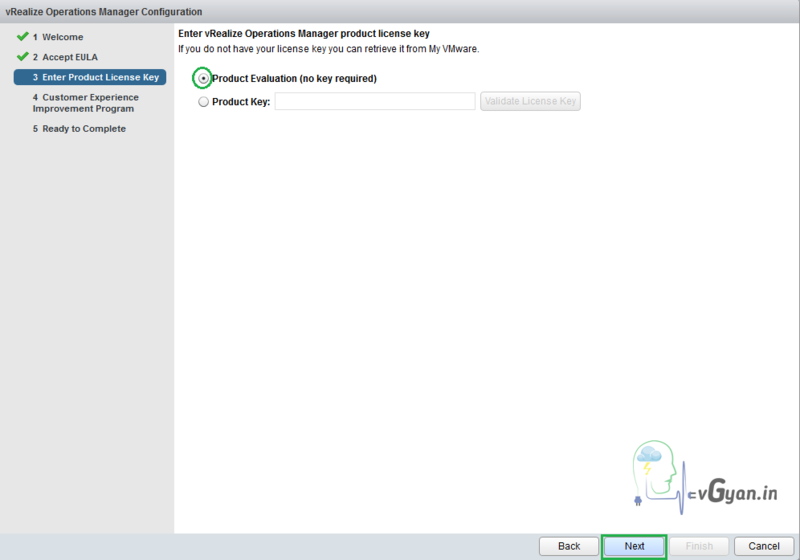 Last week we discussed about how to deploy vRealize Operations manager appliance, today we will discuss how to configure vROps manager for first use. 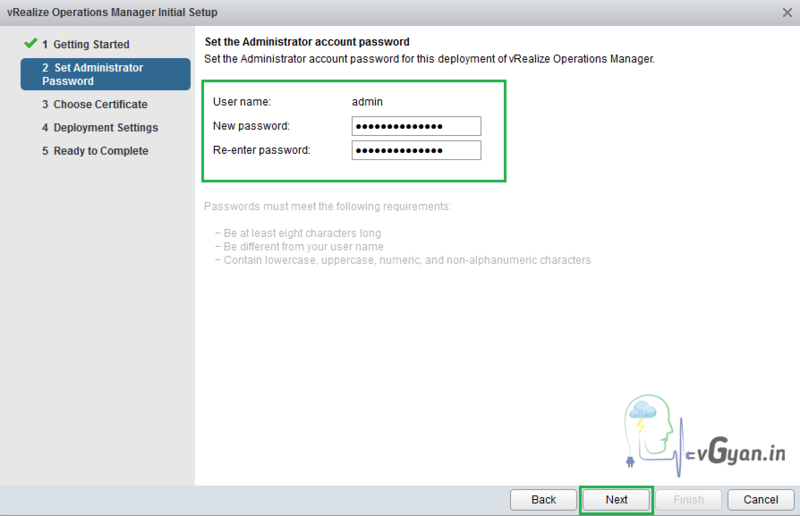 Once the admin page is opened, select New Installation. 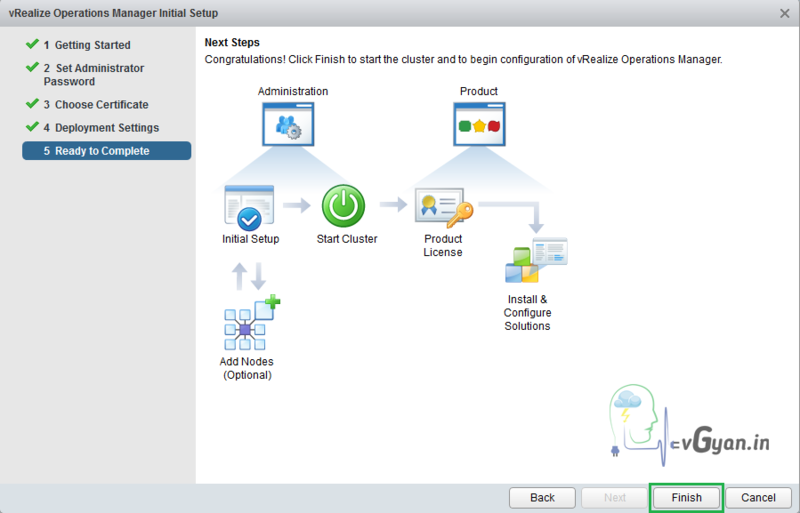 Click Next in the getting started page. 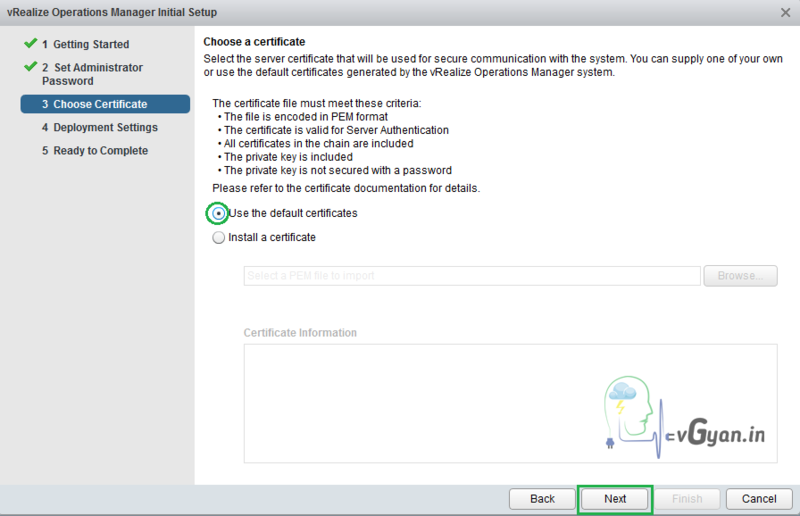 We have to a choose certificate, I am going with default certificate, if you have specific certificate for vROps you can install the same. 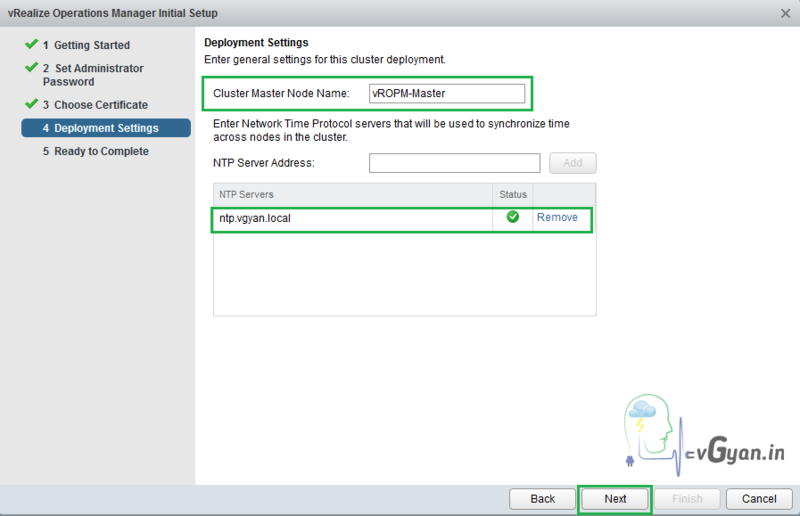 In the deployment settings, provide cluster master node name and NTP server address. 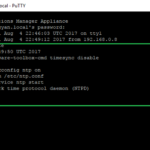 NTP server address: ntp.vgyan.local and click on add button. 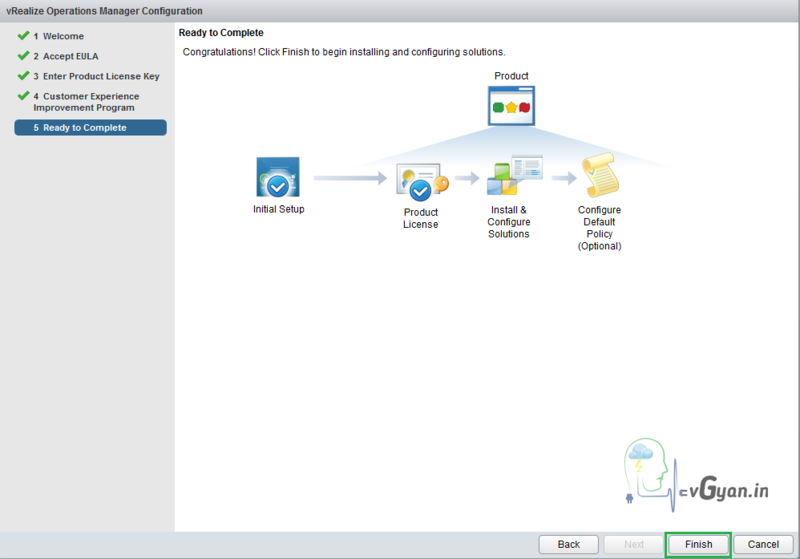 Click Finish to complete the initial setup. 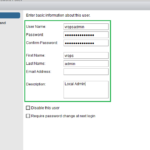 Once the initial configuration completed, It will ask you to login to the admin portal,Login with local admin user and password which we given in the initial configuration. 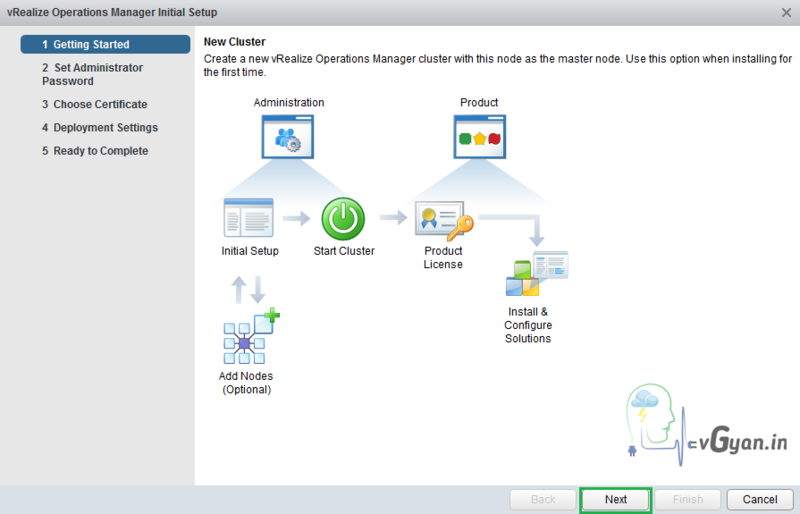 Now we are in vRealize operations manager administration portal. 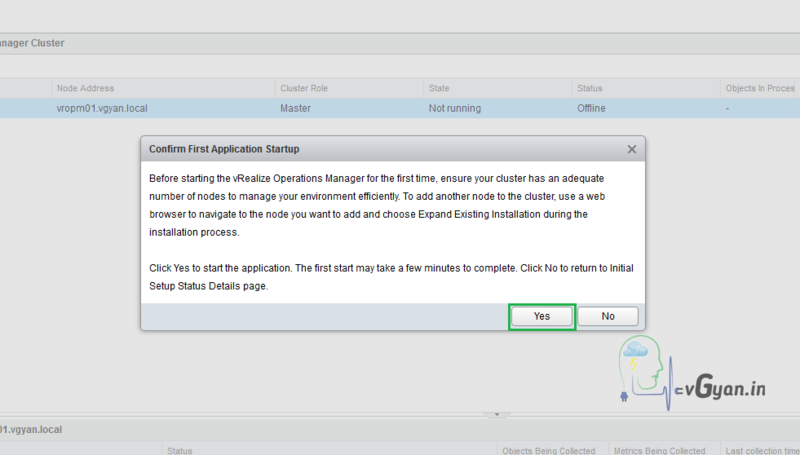 Under the cluster status click on Start vRealize Operational Manager. 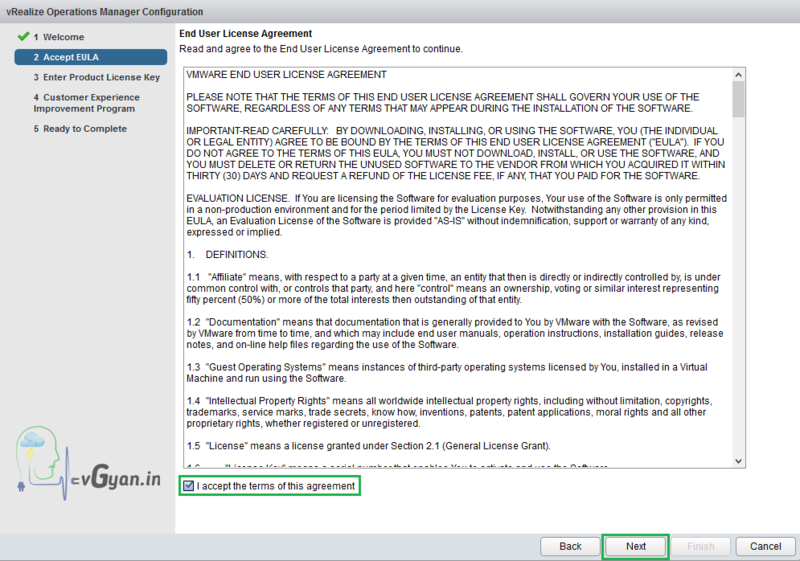 Click Yes to start the application. 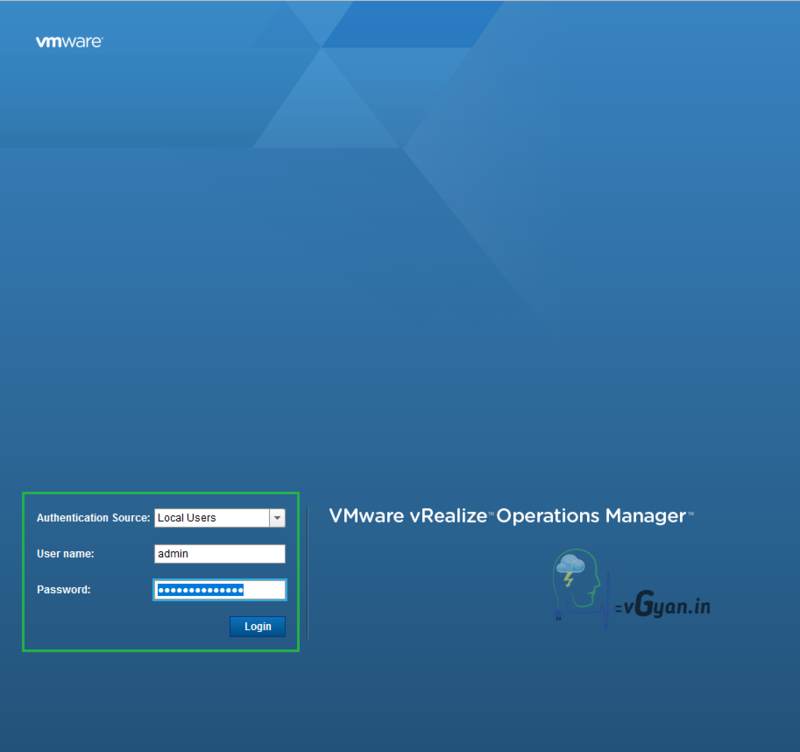 Once the application started we will be redirected to vRealize operations manager portal. 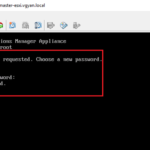 Use admin credentials and click on Login. 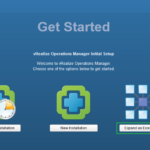 Now we are going to configure vRealize Operations manager. 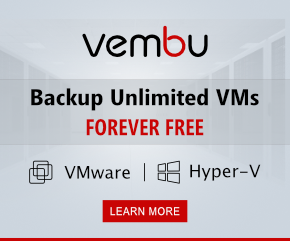 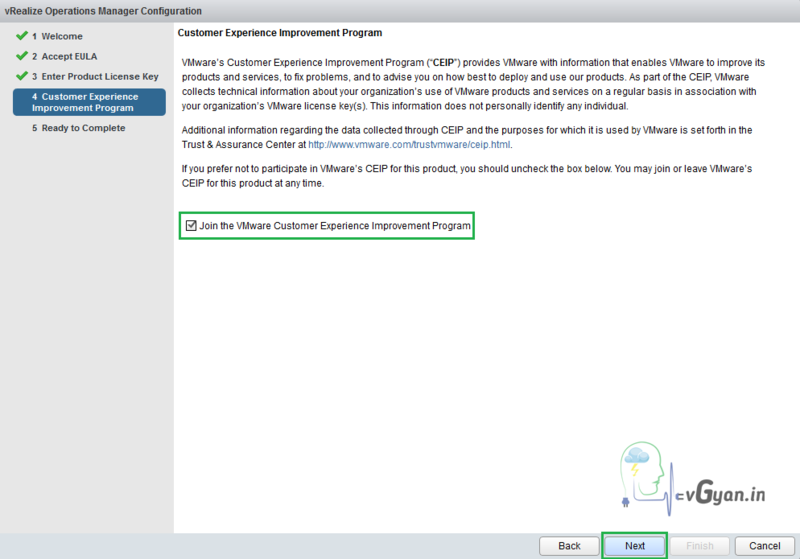 I am not going to activate vROps now, will activate it later. 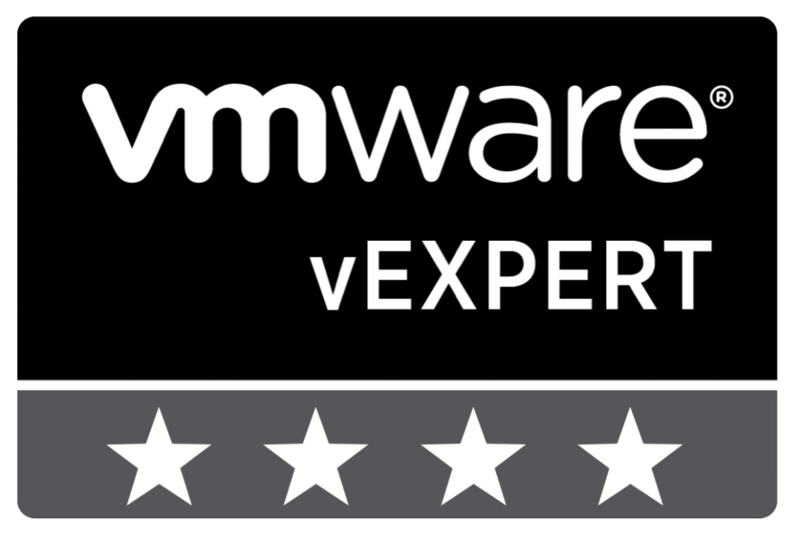 I am going to join the VMware Customer Experience Improvement program, it will help to improve the product. 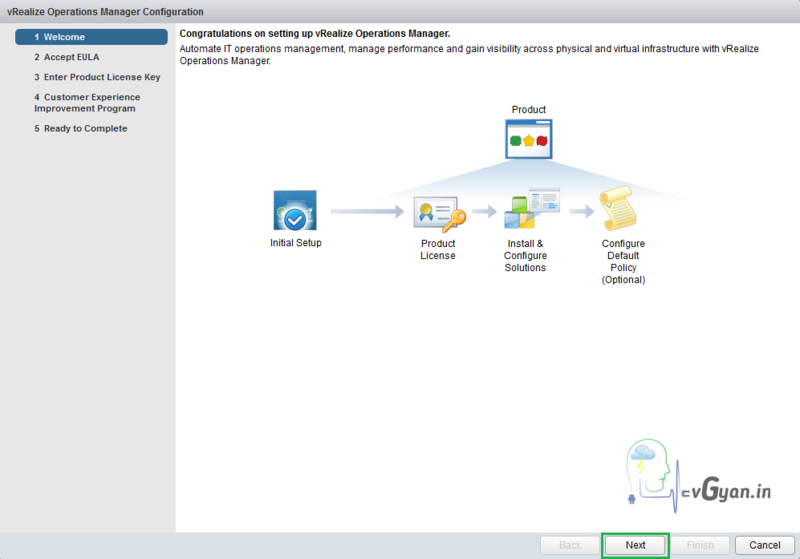 Click Finish to complete the vRealize Operations Manager configuration. 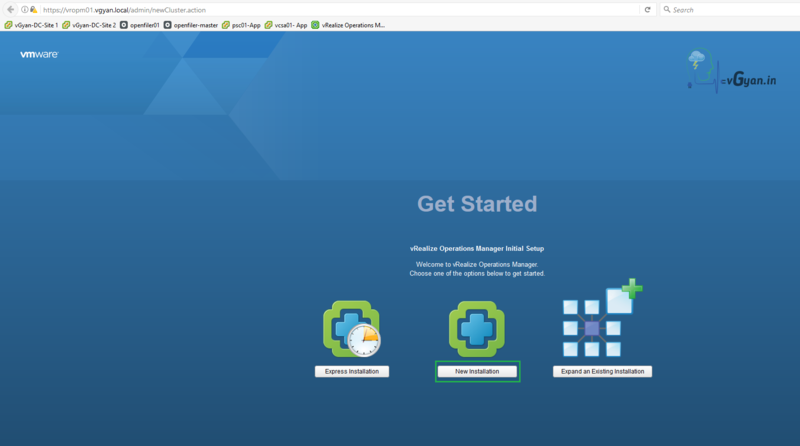 Now we completed the vROps Configuration and redirected to vRealize Operations Manager Web client. 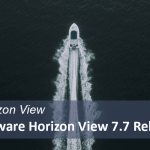 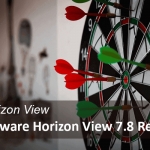 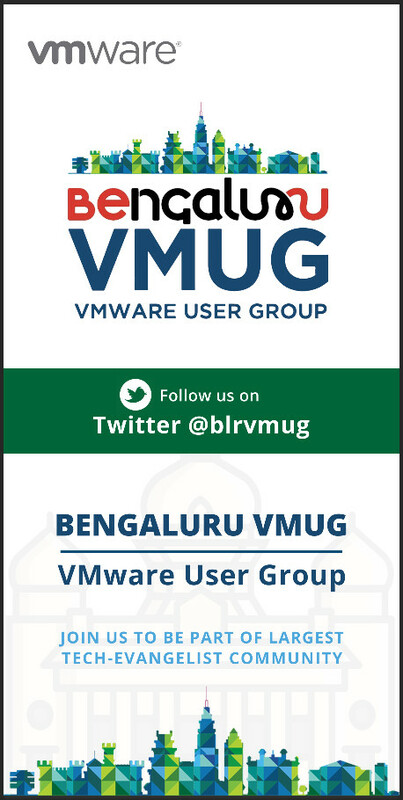 We will discuss more about vRealize Operations Manager in upcoming posts.